DIGITAL EDITOR ANDREW STOY: Considering it has Corolla underpinnings, the heart of a Prius and some fancy trimmings, I was not expecting much from the 2013 Lexus CT 200h, but this car actually impressed me quite a bit. The interior is umistakably upmarket with soft-touch materials and dense plastics complementing the refined switchgear. Even Lexus' wacky mouse interface for Enform worked well; the controller fits perfectly under the palm and redundant “enter” buttons mean you can accidentally fat-finger the controls and still get the system to do what you want without having to look away from the road. Of course, there's no disguising the CT's hybrid driveline, though I will give credit to Lexus for making it a relatively painless experience. As usual, sport mode is the way to go for any kind of performance; normal is slow and Eco makes the car feel like there's a giant rubber band stretched between the bumper and some immovable object, against which the car is constantly straining. Gas/electric handoff is as close to seamless as anything I've ever driven, and the regenerative brakes are easy enough to get used to -- the only weirdness is lack of linearity: there's initial bite then a plateau, requiring the driver to really hit them hard in a “stop NOW” situation. Handling and steering can best be described as unremarkable -- for a hybrid, that's a hell of a compliment. Usually the combination of low rolling resistance tires, electric power steering and utter absence of any sporting pretensions makes for a Conestoga wagon driving experience, but the CT 200h just feels … normal. Again, it's not a sports car, but as an efficient compact luxury car, it's nicely balanced. But what about that price tag? It's not exorbitant, but there are a lot of nice rides around the $40,000 mark that offer much more performance and utility, and they don't look quite so dumpy. Granted, none of them get 43 mpg in the city, but then neither did our CT -- the trip computer claimed a 40.1 average, but my fill-up worked out to around 35 mpg. Good, but not great. Still, if you live in one of those communities where a hybrid badge is deemed a status symbol, the CT 200h is a solid choice; I have to wonder how many potential customers walk into a Lexus dealer and drive out in the larger, more conventional (and nearly as efficient) ES 300h, though. 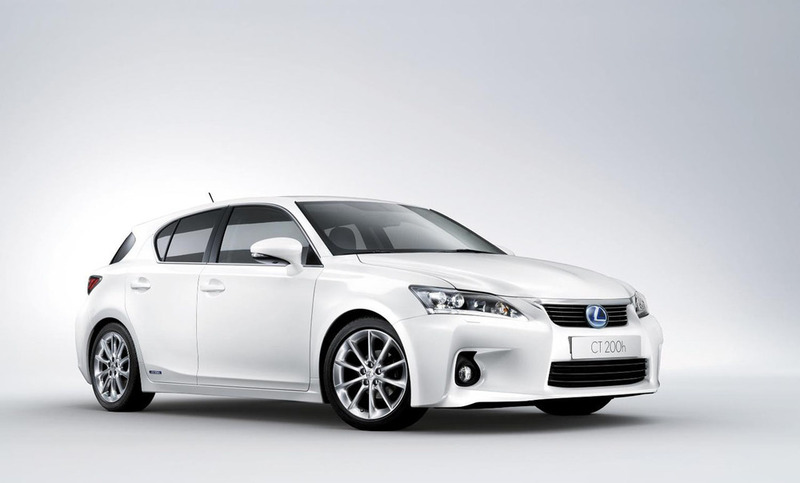 ASSOCIATE EDITOR JAKE LINGEMAN: I was a little surprised to see that this 2013 Lexus CT 200h Premium only has a total output of 134 hp from its hybrid powertrain. I was guessing that it had more power than that, meaning I didn't find the CT 200h annoyingly slow, which is the first thing I look for when testing a hybrid. So you won't go nuts struggling to blend seamlessly onto the freeway in this, which is nice. It does use the CVT, so that's something that needs getting used to, but when you put the pedal down, it goes. The CT uses electric power steering to save fuel, with MacPherson struts up front. The steering is heavier than I expected on a Lexus, but I wouldn't call it sporty. It's harsh over bumps that shouldn't upset it, but there isn't a lot bump steer, so that's good. It's just a little numb. We'll have to mark this particular moment down in history because I'm about to say something noteworthy: the regenerative brakes on the CT 200h are the best I've experienced in a hybrid. They're not perfect, but they're grabby, right from the first inch. Like any other brakes, hybrid or not, they'll take some getting used to, but at least they work as they should. What I really like about the CT, though, is the shape. The hatchback part isn't all that impressive, but with the Lexus front end, I think it looks great. The seats weren't as comfortable as the bigger Lexus vehicles, but this is kind of a sporty vehicle, so I can see it. They're still better than most of the hatchbacks out there, and about half of the sedans. I like the flip-up navigation and radio screen, which looks extra clean when you park and it closes. The buttons and switches were all self explanatory and easy to use. Panel fit is tight, and most of the dash materials look and feel expensive. I folded the seats down over the weekend and hauled a decent amount of stuff. It was surprising how much I could fit back there, which speaks to the amount of utility a hatchback offers you. If we can return fuel economy anywhere near 40 mpg, this is a vehicle I could see recommending to a friend. EDITOR WES RAYNAL: If you can get your head around spending $40,000-plus on a variant of the same platform that underpins the Scion tC and the Toyota Corolla, then the Lexus CT 200h might be for you. On paper I can't. In reality, it's better than I thought. It does look kind of cool, and it's got hatch practicality, and the interior is well built, as one would expect from Lexus. The driving is the part that's better than I thought it would be. I recently drove a Toyota Avalon Hybrid and it had the herky-jerky brake feel most hybrids do. For some reason this car didn't. It does have the hybrid synergy drive drivetrain, but for some reason it felt a lot better. It was smooth. The ride/handling surprised me in a good way, too. There's a nice thick steering wheel, good steering (proper weight and response) and body control is impressive. No, it's not quick, but it's a hybrid, so I didn't expect it to be. This is the least expensive Lexus you can get. In other words, it's the base entry price for getting Lexus' excellent dealer treatment. If you want to be in that club it's not a bad starting point. Options: HDD navigation system, backup monitor, Lexus Enform with detonation assist, eDestination, Lexus insider voice command, SiriusXM NavTraffic, NavWeather, sports and HD radio ($2,735); leather package including perforated leather-trimmed seats, driver seat memory, rain-sensing intermittent wipers with mist cycle, auto-dimming outer mirrors with memory and auto-tilt-down in reverse ($1,930); premium package with navigation including 10-speaker Lexus premium audio system, auto-dimming rearview mirror, Lexus Homelink universal transceiver ($890); illuminated door sills; ($299); premium floor mats ($280).